I’m also noticing that it gets harder to find webshops in the SERPS. Google now ranks forums and review sites above webshops, so they’ll have to buy ads. I’m starting to dislike Google more and more. This is very interesting. I can’t duplicate the issue on any other location except UK though. But I think you’re right. We’ll be seeing this more any time soon. I’m interested to see how Bing is going to react to this kind of stuff. Usually they try to emulate Google, but this is the kind of thing that makes more people not want to use Google’s search engine, and over time it just gives a better reason to try out one of the other many engines. @Tinus On the other hand, they are forcing commmercial sites into the ads, and informative sites up in the serps. In any case, I always thought it was not right to have for example one local business rank in the top 3 organic results, and its local competitor on page 30, because they didn’in invest in seo. I don’t think Bing has to react to this change…4 results above the organic search results is something Bing was already doing for about a year now I believe. Bing is also using a machine learning algorithm based on prior searcher behavior to determine how many ads to show on the average search result. For searches that do not monetize well and/or get low ad CTR they show fewer ads. 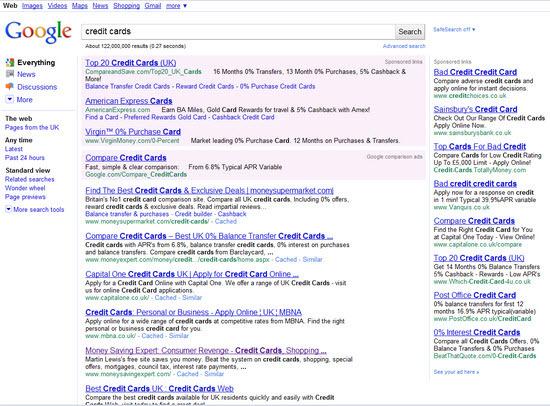 Bing shows about 3.5 ads per search result, whereas Google shows closer to 5.5 to 6. The Microsoft machine learning algorithm, called AdPredictor, is quite sophisticated. Joachin Quiñonero Candela’s technology uses Bayesian modeling to predict the likelihood of an ad click, and may include things like: searcher location, time of day, day of week, seasonality, ad position on the page, demographic details like age or gender, past ad clicking activity of that user, etc. I think that when video extensions go mainstream on Search we’ll see a real shift in brand marketing spend from businesses of all sizes. advertisers are ready to add video/3D rich media with CGI motion graphics and sound to their existing text based search campaigns. Currently video extensions are in limited beta form but it’s only a matter of time now! Google keeps making my life more difficult. I already hate the maps enough.. gah! What’s the purpose of the ad extensions? Now, there won’t be any 10 results on the first page of GOOGLE. I would like to know more details about it. The point of the ad extensions is to allow advertisers to add more information to their ads. 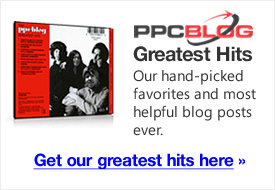 It increases ad CTR & thus how much profit Google makes from search. Ad extensions do not mean that the organic search results will disappear across the board, just that some additional % of the clicks will be on the ads (and some % less on the organic search results).